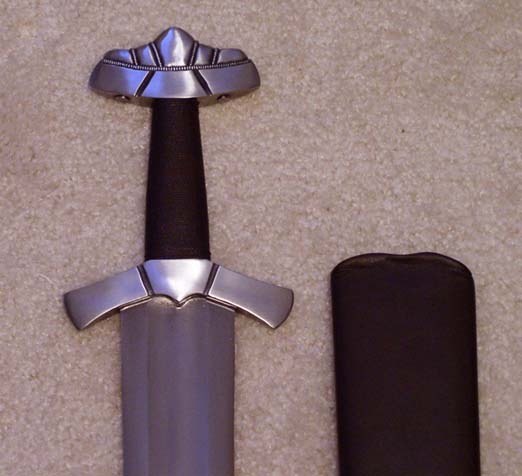 Forum Index > Off-topic Talk > For Sale: Albion Next Gen Gotland with scabbard. Posted: Wed 04 Feb, 2004 11:31 am Post subject: For Sale: Albion Next Gen Gotland with scabbard. I really hate to have to do this and I wouldn't unless I really needed the money. Up for sale(as the title states) is my brand new, just received, Next Gen Gotland with campaign scabbard. The grip is brown as is the scabbard. This sword is in perfect condition. I only admired (any drool was quickly wiped away), cleaned and oiled the blade down. My price absolute and will not go down. The reason I say this is because the cash is going to help pay my father medical bills. I've attached a couple pictures so there is no doubt. I am asking $875 shipped within the continental US. International buyers are welcome but will have to pay a little extra for shipping. I will accept PayPal and money orders(US dollars). Bank cashiers checks are good to. Feel free to email me at admjros@msn.com if you have questions. Sorry to hear about your father, Andrew. I hope everything works out . Posted: Wed 04 Feb, 2004 10:12 pm Post subject: SOLD! This sword is sold pending payment. Thanks.